Just visited again yesterday, still an average pub, concentrating on food (aren't most of them!! ), but this time the beer was gopping!! I ordered a pint of Sharpe's Atlantic......well, it looked as if it was drawn from the Atlantic itself!!! Last time I ever use the place. Average village pub really. Something of nothing. The beer was average, the pub is average. It's just.........average. Last reviewed around 6 years ago? Christ knows how many managers/landlords/whatever have passed through this place since then...has spent more time closed than open too. Always pointless in the company of the far superior Newport (RIP) and Dog & Crook, particularly since Braishfield has become very much an exclusive dormitory village of weekend homes for well heeled London types in the last few years...local farmer types not welcome any more! Some good and some bad : This was my third visit. Lovely big garden, nice location, interior of the pub is interesting - lots of bric-a-brac without being too full of it. Gents didn't look dirty, but had the stale stench of a poorly kept-to cleaning regime. Much too expensive on both drinks and food, and service very slow on both as well. This has been a feature of each of our visits. Shame really, because if it wasn't for these two issues, we'd be back a lot more often. Speaking terribly generally, real ale pubs seem to fall into one of a few categories. Some are resolutely boozers - bare floors, threadbare upholstery, a bunch of bar stools, and a choice of ales (the Fox in Twickenham sort of falls into that category). If they do food, it'll be of the rolls, crisps, and if you're lucky, ham, egg and chips. Then there are the olde worlde pubs, with thatched roofs, horsebrasses on the wall, and reasonably comfortable seating. Plus, there are the 'trendy' pubs - all polished wood floors, gastro-pub food (probably involving pies), a varied wine list, and, of course, ale (many of which will have cod-amusing names). Then, there's the Wheatsheaf. I can honestly say I've never seen the interior of a pub quite like this one. It reminds me of an eccentric (and rich) old woman's lounge - every nook, cranny, corner and surface has stuff on it - and interesting stuff (some of which is for sale - like the insect shaped lanterns). No two chairs are the same, and some appear to be antique living room furniture. Going into the bowels of the pub, you actually have what appears to be someone's front room, complete with bookshelves, chachkis and a bicycle. Heading out into the large garden, you'll find a chicken run and a couple of pig enclosures (free range, of course - more on that in a minute). It is eclectic, to say the least. And I love it. I noticed four real ales on, none of which I had heard of. There were two definite session ales (at under 4%), and two slightly more robust offerings (at 4.0% and 4.5% respectively) - sadly, I cannot quite bring to mind what they were (shame on me) - I gather, however, these change regularly. There is also a good wine list (though I did not sample any wine). Needless to say, there was the normal lager selection all pubs seem obliged to carry. 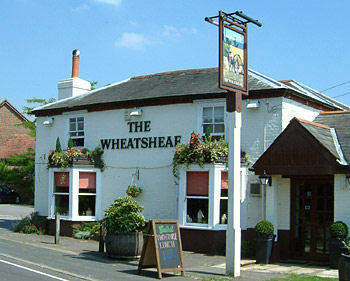 The Wheatsheaf keeps its own pigs, and these are not pets. They are free range (there was a sow suckling her young in the mud as I watched), and they are used for all the pork offerings (and there are many) on the menu. They are justifiably proud of these pigs. My two friends and I visited today - a Sunday - and so we all three had the roast pork. Whilst one piece of the three was slightly dry, the rest was utterly superb. I had no idea that pork could have so much flavour. The roast was served with a Yorkshire pudding which looked dark, but was flaky and delicious, two large, unpeeled carrots complete with a bit of greenery at the top - these, I believe, were honeyed and were extremely tasty, some broccoli (still crisp and green), home made apple sauce and, of course, crackling. And it was all delicious, and there was plenty of it. Each roast was �9.95. Other main courses on the menu were comparatively priced, ranging from �8.95 through to �16.95 (or �18.95 for the Slimmers' Platter - "Our famous slimmer�s platter: absolutely nothing on a beautifully glazed plate, garnished with a knife & fork!! You�ll lose pounds ! " Indeed.) They also do a gourmet burger day on Wednesdays - that's something I'd love to try. The service was VERY friendly. When investigating the beer selection, I was offered tastes before I bought (which I took up), and advised what to expect from the brews. The young man who took both our drink and food orders was polite and endearing - he explained that he joined the staff a year before so that he could eat for free, the food is that good. He also remarked that he keeps running across little surprises in amongst the quirky stuff hidden in various shelves and corners. There are only a couple of niggles, and one kind of goes with the territory - pigs have a distinctive smell. Fortunately, the do not put but one bench near the sty, so you are not sitting right on top of them, but had the wind been blowing in another direction, you'd have wanted to sit inside. When we ordered a coffee, this took sometime to come; because we were on a time limit, we ended up cancelling the coffee (which they did with good cheer). Apparently, they were having trouble with the machine. They could have told us. The loos were clean, bright, airy and well decorated, though unremarkable (I cannot, of course, comment on the men's rooms). The pub has a decent sized car park. All in all, this was an excellent country pub, complete with living country. The beer was well kept, with a good choice. The food was excellent. The setting was superb, if a bit malodorous at times. I'd love to spend longer there.